So after about 5 months of using the Kari Traa gear I am just now getting a review put together. I must say I was pleasantly surprised with the quality of the Kari Traa items I received, they were the Mathea Shorts, Marit Tee Shirt and Socks. Black with Pink. Sizing I believe is true to size. I got Medium although I am usually a small and they fit on the larger size but I think for my height a small would have been too short. They have a nice moisture wicking lining and the outer is extremely light and airy with small pinholes throughout. Great for long runs in the heat. Nice drawstring which helps adjust and make sizing a little more customizable. Nice length too, not too short, long enough to be modest though. They seem to be very durable because they were worn all summer and washed many times and still look brand new! I had many compliments on this T Shirt, some even asking if I got it from Lululemon. It too fits true to size, I ended up getting a small which fits snugly but not tight. It’s made of a great moisture wicking fabric with some stretch. the design in it is terrific, adds some pizzazz to the shirt while still maintaining its nice neutral grey colour. I wore it more often for casual wear rather than workouts because who wants to ruin such a nice shirt with gross sweat? I am tall with a long torso and found it more than long enough for me. I love it and would buy one on my own! Another great new item for my cycling and running wardrobe. Fit wonderfully with a nice arch wrap around. I got the size medium and I have a size 9.5 foot and they are perfect. They are not too high up the ankle and not low enough that they fall into the shoe which happens sometimes. 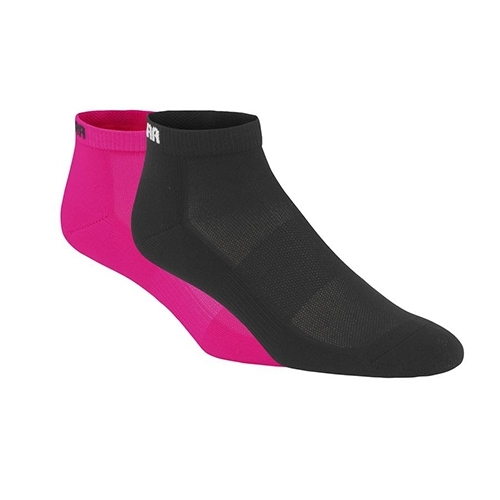 They are a nice, thin fabric so fit well in tighter fitting cycling shoes. Not sure how they’d fare in the winter but for summer runs and rides they were lovely. All in all I have to say I was very happy with the quality of the gear I received from Kari Traa. From the the stitching in the shorts to the pattern in the shirt and the great bright pink and orange socks, I felt like I DID win the lottery. Thanks Running Free for the opportunity to try out this terrific brand!